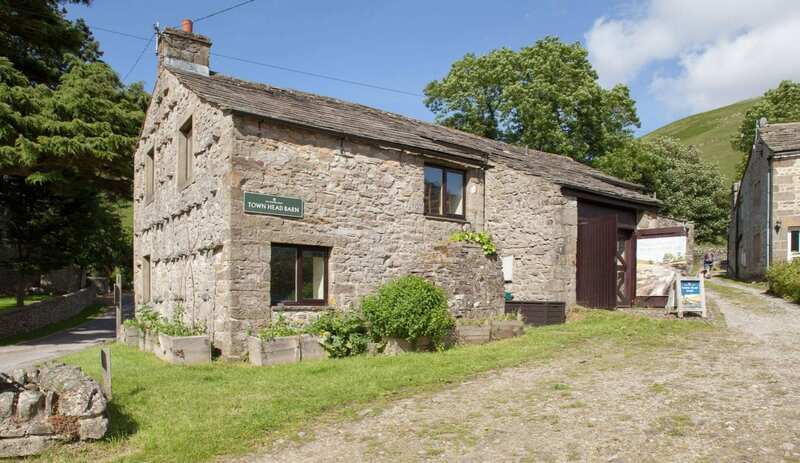 In Upper Wharfedale, in the small village of Buckden, Town Head Barn has been converted by the National Trust to sleep 13. 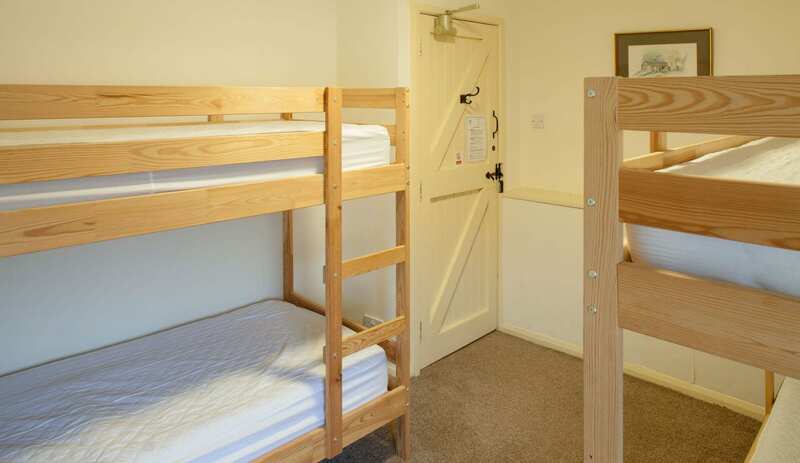 The accommodation comprises a living room, kitchen, one bunkroom on the first floor and two bunkrooms and a bathroom on the ground floor plus a single leader's room with en suite facilities. Buckden Pike at 702m high is just waiting to be climbed for those with plenty of energy and enthusiasm and is accessible right from the door. 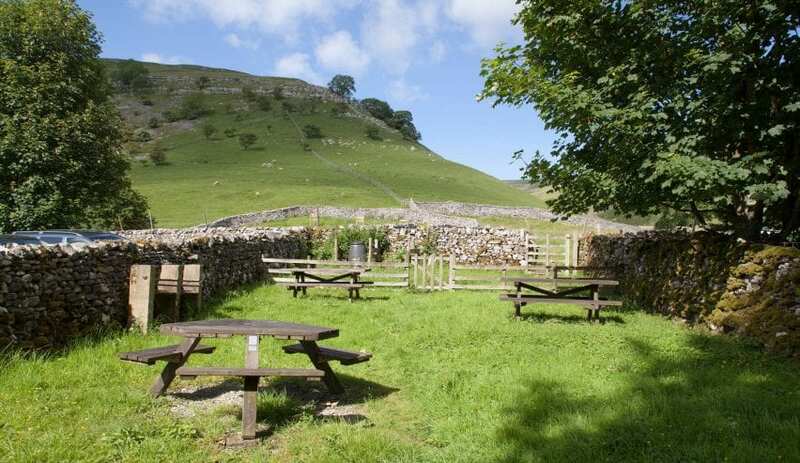 There is a tea room in the village and a couple of pubs within two miles of Buckden. Kettlewell is 3.5 miles away and Skipton is around 20 miles. There is plenty of space and storage for boots and coats in the entrance way and the communal lounge and dining area has an open fire. 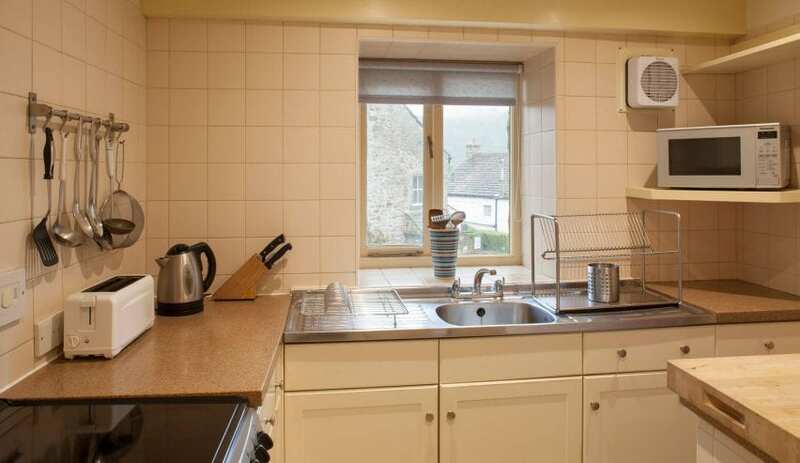 The kitchen is small but well equipped. There are two parking spaces (not reserved) outside the front door and further car parking in the National Park car park in the village which is pay and display. The bunkhouse does not have its own garden, but there is a National Trust picnic area with a built in barbecue just 100m away. Photos ©Roger Coulam This accommodation is featured on our map of Yorkshire and Lancashire and here is its own website. 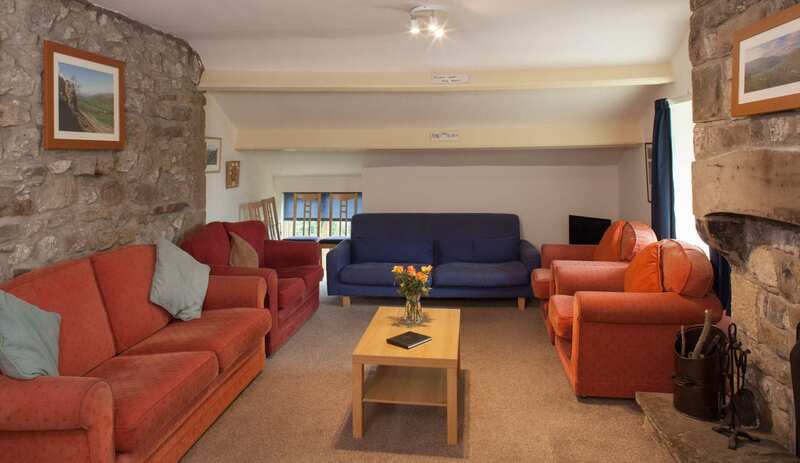 From £338 for two nights sole use. (Min booking 2 nights). From Skipton follow the signs to Grassington on the B6265 . Continue along the road to Threshfield then follow the B6160, signposted Kettlewell. Continue through Kettlewell and Starbotton and enter Buckden. Town Head Barn is on the right just after you pass the village shop and just before the turning into the National Trust car park (Public car park - pay and display) From Richmond take the A6108 to Leyburn then follow the A684 towards Aylesgarth. About 1 mile after Swinithwaite take the B6160 on the left and follow this to Buckden. The National Trust car park (Public car park - pay and display) is on your left as you enter the village and Town Head Barn is on your left as you walk out of the car park just past the toilet block. Skipton train station is 18 miles away. Buckden bus stop is 0.2 miles. 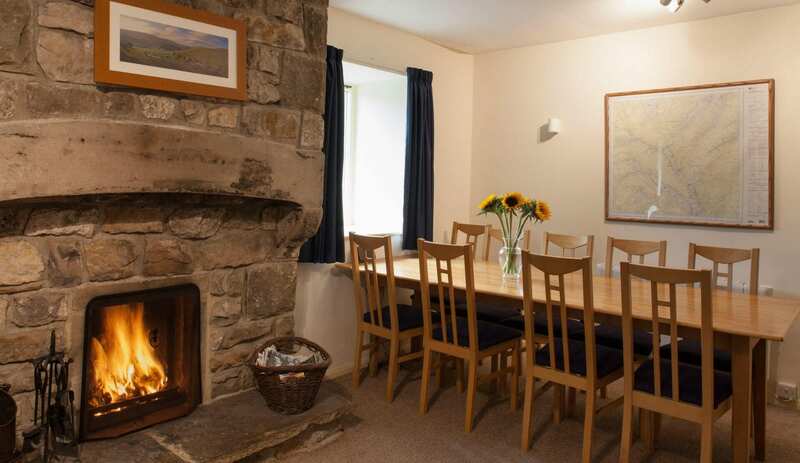 This accommodation allows dogs by arrangement, is in a National Park, is available only to groups, has a pub within walking distance and is on the National Trust Bunkhouses map. 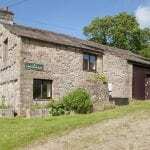 Upper Wharfedale, which is where we’ll find Town Head Barn, is one of my absolute favourite places. The postal address says Skipton, but that charming castle-and-market town is miles off. That’s because here in the village of Buckden, we’re miles away from hustle and bustle. Outside is the green hills and the limestone outcrops. Just down there is the clean bubble of the River Wharf. Sheep, clear air, fabulous walking country, Aaahh. Deep relaxing breaths. The Barn is a wonderful place to stay to explore the area. Like all the National Trust places, it is immaculately kept and charming. A converted stone barn that sleeps 13 in what my kids call ‘an upside down house’ configuration. 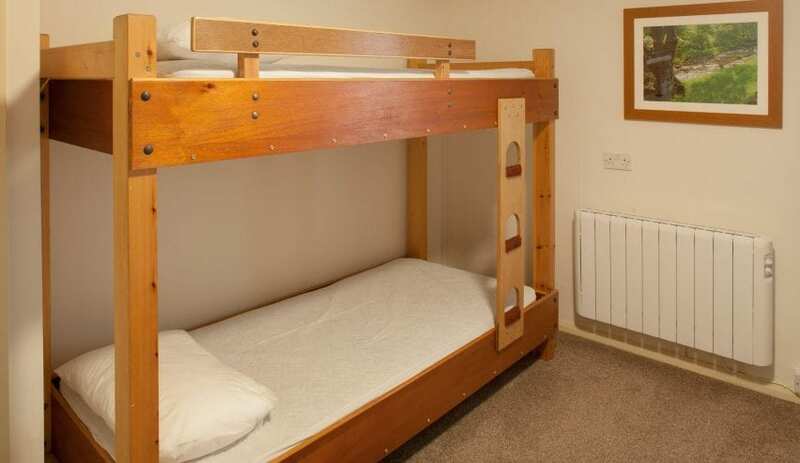 The sleeping accommodation is on the ground floor and the living room and kitchen upstairs. Outside is the lovely village of Buckden with tea rooms and pubs. Beyond is Buckden Pike calling out to be climbed and beyond are the attractions of Malham and Goredale Scar.